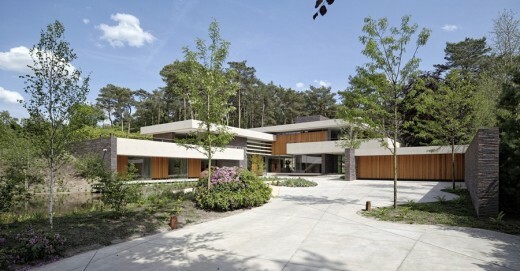 A site in a pine forest with a height difference of six meters is unique in the Netherlands. The clients are aware of that and asked us to design a ‘living’ house which fully adopts the qualities of the plot. They cite three icons as a reference, each with their own qualities. De scenic naturalness of F.L. Wright, the openness of Mies van der Rohe and the tactile materiality of Zumthor. With a sense of necessary modesty we accepted the assignment. The plot exists of three areas: dense vegetation towards the street, a large open space at the front and an open pine forest at the back of the plot, which is characteristic for the area. An offshoot from the ‘Utrechtse Heuvelrug’ dune lays on the north side of the plot, which results in the six meter height difference. We strictly followed the division in three parts. The different volumes of the villa are situated on the north and east border of the open space, in and on the dune. The garage and the long garden walls enclose a cultivated courtyard, the only area on the plot where nature is directed by man. The main areas of the residence, such as living room, kitchen, office, master bedroom, roof terrace and library, are situated on the first floor which provides the best experience with the forest. Because of the setting on top of the sand dune, one can walk straight out into the forest. The guestrooms and the pool are situated in the dune and on the ground level of the courtyard. The pool is enclosed on three sides with large glass sliding doors. This ensures an outdoor feeling in the wintertime and in warmer periods it can be transformed into an outdoor swimming pool. The connection between the floors is made on two specific places: a closed core with an elevator, stairs and the backdoor and a main entrance which, with its double height, accommodates large works of art and theatre performances, and contains a spiral staircase. Besides clear references to the icons, who acted as inspirations for the plan, the connection with the location is the most profound base for appearance of the villa. The colour of the applied concrete is directly derived from the dune sand. All the concrete is seamlessly poured in one piece. The robust walls are perpend-less and there is no pointing used for the masonry in thin bricks, that measure up to one meter. The colour nuances in the mix of the bricks, beige, orange and green on a dark shard, are deduced from the bark of pine trees at hand. Accents in the facades are made of vertical wooden slats of varying widths and colours. They reflect the lines of the forest. The window frames, when visible, have a coating that takes over the colour of the surroundings. Finally, all the usual image-disturbing solutions such as expansion joints and metal trims have been left out, giving the building a great naturalness. All these components collaborate in deeply connecting the villa with its location. This idea is continued in the interior. The floors, in the same concrete colour, have different finishes, from roughly sanded to highly polished depending of the character of the space. The special brickwork establishes, besides the many pieces of art, a painting on its own. 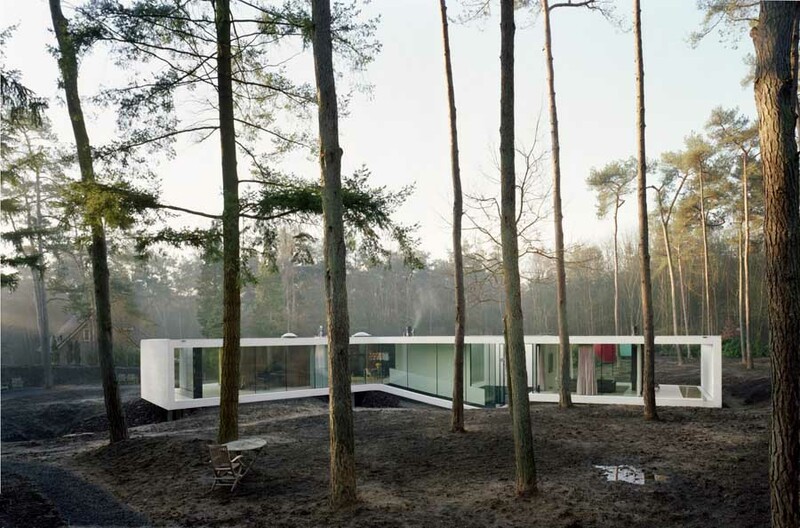 The surrounding forest becomes a part of life in the house because of all the glass. In certain places inside and outside are literally connected with each other. 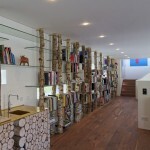 The rough concrete floor from the courtyard continues to surround the swimming pool and Piet Hein Eek built a bookcase for the office space from harvested birch trunks and glass panels. 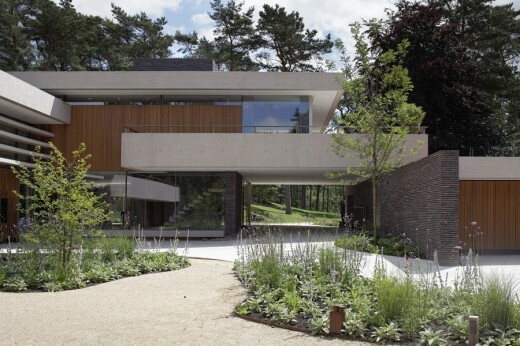 The same birch trees in the garden, design by OSLO, define the atmosphere in the area between the villa and the street. The garden stems from the design and materialisation of the villa, cultivates in the courtyard with connections to the existing forest. The joint search from the architect with the client for the right mix of familiarity, naturalness and surprise led to this unique home. By bringing together a powerful image and using the qualities of the site, a house is designed that fits the residents like a glove.